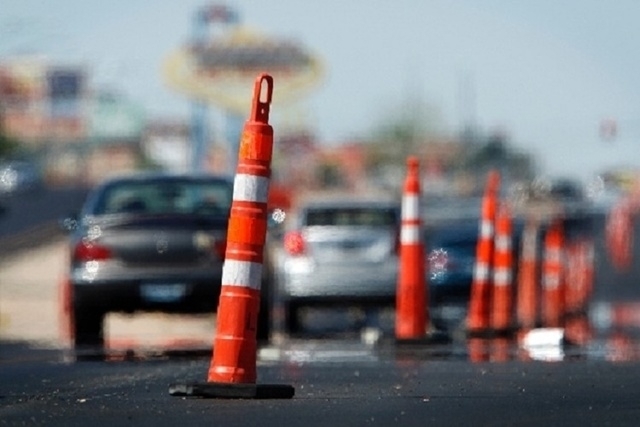 Here’s a list of all road work taking place in Las Vegas next week. ■ Lanes of Fourth Street will be disrupted for water and sewer line work between Bonneville and Clark avenues through Monday. ■ Lanes of Hualapai Way will be disrupted for storm drain work between Elkhorn Road and Severance Way through Tuesday. ■ Lanes of Rainbow Boulevard will be disrupted for conduit installation and sidewalk repairs between Via Olivero and El Parque avenues through Wednesday. ■ Tamarus Street will be closed at Reno Avenue and the center of Reno, both east and west of Tamarus, will be restricted to one lane through Friday for sewer construction work. One lane will be open for traffic along the south side of Reno with flagger assistance. Reno will be open against the curbs for eastbound and westbound traffic. Southbound Tamarus traffic will be detoured to Tropicana or Hacienda avenues. Northbound traffic will be detoured to Spencer Street, then back to Tropicana. Work will be conducted from 7 a.m. to 3 p.m. Monday through Friday. ■ Lanes of Stewart Avenue will be disrupted for the expansion of the detention center between Spectrum Boulevard and Mohave Road through March 28. ■ Lanes of Rampart Boulevard will be disrupted for landscaping between Summerlin Parkway and Lake Mead Boulevard through April 1. ■ Garces Avenue will be closed at Main Street for general street improvements through April 4. ■ Lanes of Oso Blanca Drive will be disrupted for underground utility work between Durango Drive and Gilcrease Avenue through April 5. ■ Lanes of Anasazi Drive will be disrupted for landscaping between Lake Mead Boulevard and Town Center Drive through April 8. ■ Lanes of Hualapai Way will be disrupted for landscaping work between Town Center and Alta drives through April 8. ■ Lanes of Lamb Boulevard will be disrupted for driveway repairs between Bonanza Road and Elm Avenue through April 8. ■ The Stephanie Street bridge over U.S. Highway 95 will be closed through mid-April for new construction. Traffic will be blocked in both directions and detoured to Russell Road or Galleria Drive. ■ Lanes of Decatur Boulevard will be disrupted for pavement reconstruction between Craig and Lone Mountain roads through April 25. ■ Transit Route 109, the Maryland Parkway route, will be detoured because of road construction through April. Stops on George Crockett Road will not be served. Alternative stops are available on Routes 117 (Las Vegas Boulevard South and Silverado Ranch Road) and 217 (Warm Springs Road and downtown Henderson). ■ Lanes of Grand Teton Drive will be disrupted for median island maintenance between Durango and Buffalo drives through July 16. ■ Sunset Road in Henderson will have periodic lane shifts and restrictions between Mountain Vista Street and Annie Oakley Drive through mid-July for major resurfacing improvements. Work will include widened bike lanes in each direction, signal improvements at Sunset and Athenian Drive and upgrades to existing sidewalk ramps and driveways. Most work will occur daily from 9 p.m. to 6 a.m.
■ Work will continue through the summer on a 13-mile paving project on Interstate 15 north of Mesquite. The project will run from the Nevada state line to the Virgin River Gorge and include improvements to the Littlefield bridge at milepost 8. Work will occur Mondays through Fridays, 6 p.m. to 6 a.m. Work will begin on southbound lanes at the Littlefield exit. ■ Work on the Regional Transportation Commission’s Flamingo Road Corridor Improvement Project will continue on the west side of Flamingo Road from Rainbow Boulevard to Hotel Rio Drive through fall. ■ Traffic will be disrupted for projects on Racetrack Road and the area around Heritage Park in Henderson through December. Racetrack will be resurfaced from Boulder Highway to Athens Avenue, expanded to four lanes from Boulder Highway to Burkholder Boulevard and Burkholder to Athens, adding bicycle lanes, installing a traffic signal at Blue Lantern Lane and a traffic roundabout at Newport Drive as well as a vehicular bridge over a flood channel on Newport. ■ A road widening project will delay traffic on Volunteer Boulevard from Executive Airport Drive to Las Vegas Boulevard and Executive Airport Drive will be repaved from Volunteer to St. Rose Parkway. The project will run through February. The average gasoline price Friday in the Las Vegas Valley was $2.30 per gallon. It was $2.30 in Nevada. The national average of $1.99 is up 9 cents from a week ago, up 26 cents from a month ago and down 44 cents from a year ago.